Discover a possible plot to kill King Helseth. Speak to King Helseth in the Royal Throne room to receive your orders to investigate an assassination plot. Talk to the Orc Bakh gro-Sham in the Winged Guar in the Godsreach area using the code phrase uncle's farm. Return to Helseth with the news that Queen Barenziah is the plot's target. Travel to Barenziah's room at the top of the Imperial Cult area within the Royal Courtyard. Close the door to Barenziah's bedroom and the door to Imperial Cult Services. Then hide behind the screens until around 9 p.m. the next evening. 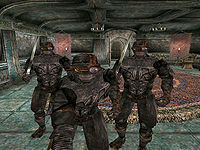 Intercept and kill the three Dark Brotherhood Assassins. Return to King Helseth for your reward of Helseth's Collar. After investigating the disturbance for Tienius Delitian, you are told to speak to King Helseth in the Royal Palace Throne room. He slothfully apologizes for the little incident with the Dark Brotherhood as it seems that someone mentioned that you were vying for the throne. The King certainly doesn't seem to take the threat of the Nerevarine lightly, but plays down the matter. After this little bit of unpleasantness Helseth will ask you to look into another possible assassination plot. You are to meet with an Orcish informant in the Winged Guar in Godsreach by using the code phrase uncle's farm. The quickest way to the Godsreach area is through the Royal Courtyard, to the Plaza, and West to the Godsreach entrance. The Winged Guar is the Northern building in the center of the area. Bakh gro-Sham is the only Orc in the place and will respond when you mention the code phrase, though you may need to raise his disposition a bit to get him to admit to recognizing the code. Although Bakh thinks that the king is paranoid, he believes to have found a plot on the Queen Mother Barenziah's life, without further information on who exactly is involved or why. With this sparse bit of information, return to King Helseth, who says it confirms what he has heard from his other informants. He now wishes for you to protect the Queen from these assassins and goes on to tell you exactly how. Helseth doesn't want to station more guards around the Queen as this would alert the assassins. Further, some of the guards may even be involved in the plot so this might actually increase the danger to the Queen. Instead, you are to be the sole guard outside the Queen's chambers, hiding behind a screen and deal with the killers whenever they show up. The Queen's chamber can be found through the Imperial Cult area at the back of the Royal Throne room. You may speak with the Queen though she is simply 'unconcerned' about the plot to kill her. The screen Helseth mentioned is just outside her chamber and is conveniently slightly transparent so you spot anyone who tries to enter the room. You most likely will not encounter anyone for some time as Helseth only mentioned to expect the assailants the next night. You also must make sure that the door to Barenziah's bedroom is closed and the other one is closed as well, as to not alert the killers. You will receive a journal entry when you are in the 'correct position' to intercept the assassins. The best bet is to save and then wait for a few hours for the killers to appear (they should come in around 9pm). The light will go out and you hear whispers and grasp that the real target is you. The door to the Queen's chambers is now magically sealed, leaving you trapped behind the screen. No matter, there are three Dark Brotherhood assassins who have a good deal of hit-points. They, however, don't hit very hard and are not magic resistant, so taking them out shouldn't be very difficult. You'll receive another journal entry when you've killed them all. Return back to the King to report your success in "protecting the Queen". He seems surprised that you succeeded and rewards you with Helseth's Collar and an offer to be of further service to your king. Don't be surprised if you do not initially receive the journal entry indicating you are in the correct position. If you are behind the screens and both doors are closed, then simply wait until the evening and your journal should update at the same time the assassins enter the room. 10 King Hlaalu Helseth has spoken to me about possible threats to his monarchy. He would like me to meet an informant of his at the Winged Guar, and ask the man about his "uncle's farm." His informant is an orc, and should be easy to find at the bar. 20 I've spoken to Barenziah about the plot Helseth suspects. She finds the idea a bit farfetched. She suggests I speak with a friend of hers, Plitinius Mero, who can often be found wandering in the Palace Courtyard. 30 Plitinius Mero tells me that Helseth is incredibly well protected, and any attempt on him would be unlikely to succeed. He suggests I speak with the informant, though. Also, Mero has told me I may return to him any time I am in need of information. 40 I have found Helseth's informant in the Winged Guar. His name is Bakh gro-Sham. 50 Bakh gro-Sham believes that Helseth is generally paranoid, but that this time there may be an assassination attempt planned. The attempt, however, will be on Barenziah's life. 60 The Queen Mother is unconcerned about any attempt on her life. She believes it to be nothing more than a rumor, and if not, feels completely capable of defending herself. 70 Plitinius Mero does not believe that an attempt on Barenziah's life makes any sense. He does say that Helseth could be using this as a sort of test, and wouldn't be above putting his mother in harm's way. 80 I've relayed the information to King Helseth regarding the plot against his mother. He has asked me to wait in the room outside Barenziah's chambers tomorrow night and protect her from any attackers. I am to close both doors in the anteroom and hide behind the screens in the room, so as not to alert the attackers. 85 I am in the position where King Helseth told me to wait outside of Barenziah's chambers, and I have closed the door to the room behind me. 90 I have defeated the assassins. 100 Finishes quest I reported to Helseth after the assassination attempt. He was pleased, and perhaps a bit surprised, by my success. He rewarded me with a magical collar, a symbol of my loyalty to his throne. This page was last modified on 24 October 2018, at 06:24.